● Buy Lexmark Genuine ink and Paper for Best Results! ● This high-resolution black cartridge uses Lexmark's exclusive pigmented black ink. This ink coupled with an increased number of printhead nozzles adn swath size, enables consumers to consistently produce high-qualityprints at unprecedented print speeds. 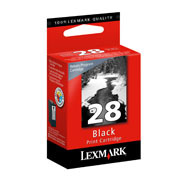 ● The #28 black cartridge reflects a $4 up-front discount** compared to alternative cartridges in exchange for agreeing to return the used cartridges only to Lexmark for remanufacturing or recycling. ● Print business quality text and graphic documents with high visual impact due to sharper black inks. ● This cartrige contains redundant nozzles, which help ensure consistent print quality. Nozzles are laid out in pairs, so if one becomes clogged or fails, the other continues to print. *Non-refillable cartridge licensed for single use only. Return empty cartridge only to Lexmark for remanufacturing, refilling or recycling. A variable amount of ink remains when this cartridge must be replaced. Replacement cartridges (28A) sold without those terms are available through www.lexmark.com. **Discount reflects the differenc between Lexmark's suggested street prices for the equivalent cartridges; actual cartridge prices and effective discount may vary based on reseller pricing and promotions.